I hope that you are keeping warm because if it was cold (45F)in Miami this morning, it must be freezing in the UK. Here is the coleslaw recipe that I have be telling you about. I am not a big fan or the typical coleslaw. Sometimes people put too much mayo, sometimes too little, it just seems like they cannot get it right. Actually, I really like the one you used to make at Clark which had no mayo, just lemon and olive oil! It is really good in the summer time when you want some crunchy freshness! 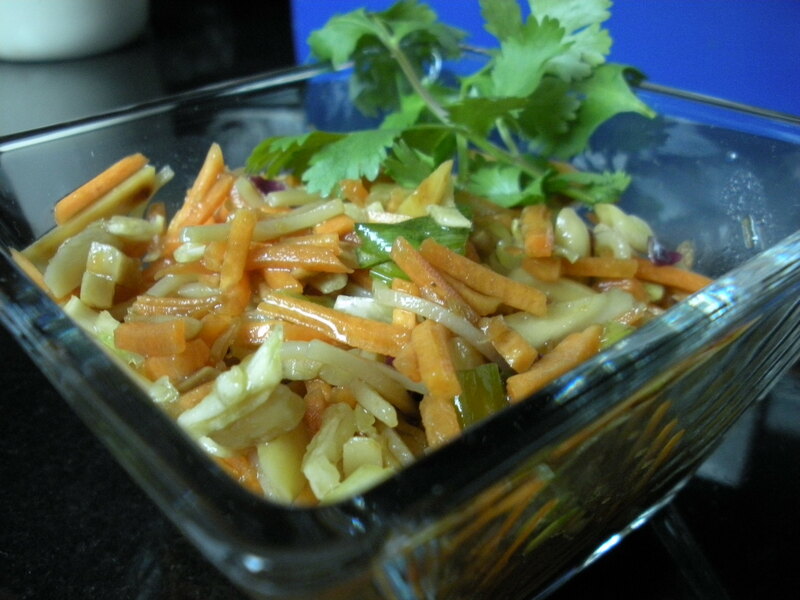 A few years ago, my mom gave me this coleslaw recipe which has an Asian twist to it. It is really good…. I mean if you add soy sauce to anything it is always going to taste delicious. I have been making coleslaw a lot lately since I discovered the shredder blade in the Cuisinart, it just makes it SO much easier. You shred the vegetables, you dress, you eat… how much more simple could it be? 1. Shred and cut the vegetables and place in a large bowl. 2. Mix the ingredients for the dressing in a small bowl. 3. Add dressing to the salad and garnish with peanuts and cilantro. Tomorrow we are having our first Shabbat dinner at our place with the family. It is my mom’s birthday and my in-laws are in town. Sunday I run my half marathon…. so I am loading up on carbs :)! Sounds like you had a great weekend! I can’t wait to make sushi. It is something that I have wanted to do for a long time, to have a sushi making party. We had a really nice weekend even though it was a little chilly and windy we got to have lots of fun. 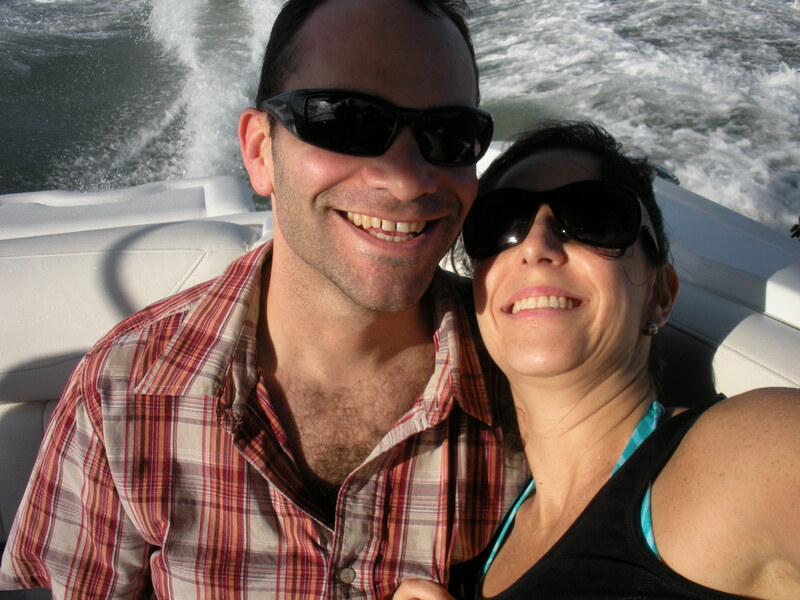 We got invited on a boat on Saturday afternoon and as funny as like is, we had just gone down to the beach for the first time in a few weeks, even more than a month, and were enjoying the warm sun when I got a text message from a friend asking me if we wanted to go on a boat. 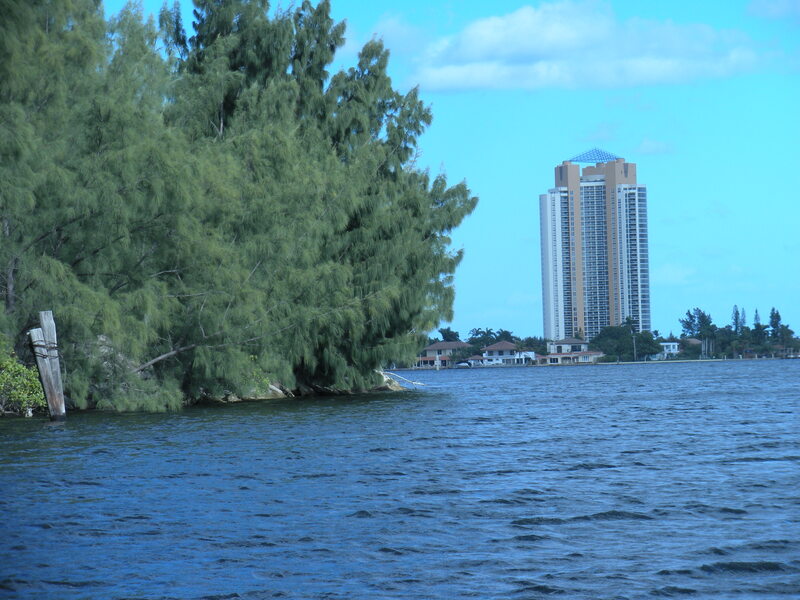 My life is pretty ridiculous right now… so we jumped and went on a boat all afternoon. 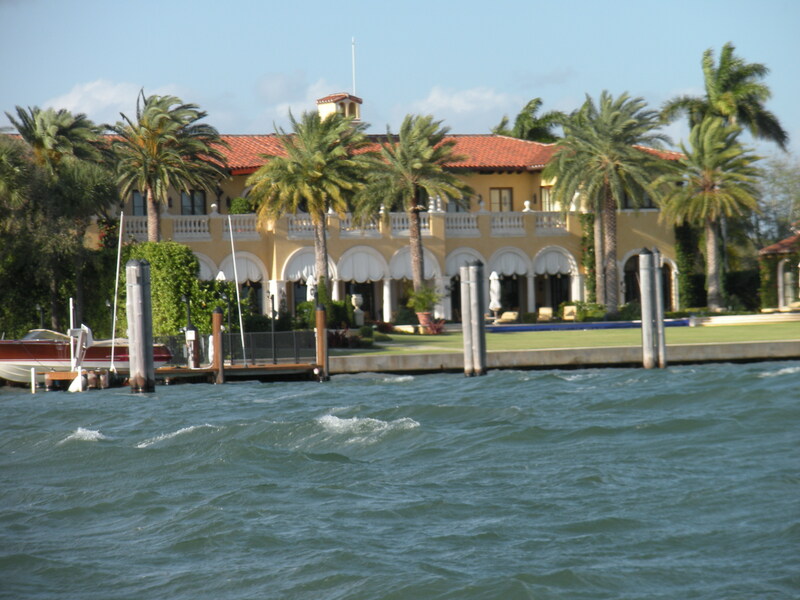 We got to go in and out of the intercostal canals and look at beautiful mansions! At one point the boat suddenly stopped working for like 15 minutes and we thought our fun was over, but after having the men play around a bit the boat restarted and we continued our journey to a seafood restaurant right on the water. So about that quinoa. Someone told me that red quinoa is even better for you than the regular quinoa so I bought it one day while I was shopping at Whole Foods. 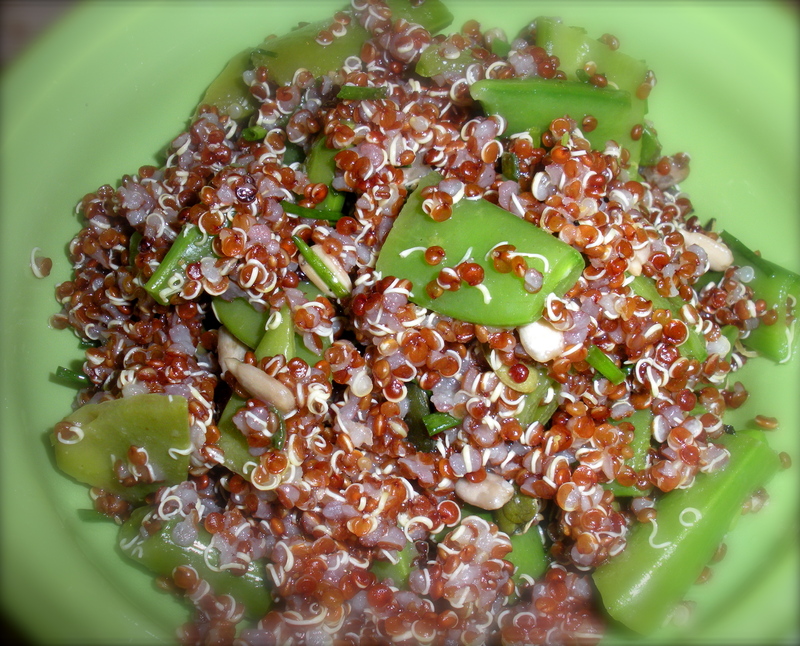 Quinoa originated in the Andean region of South America, where it has been an important food for about 6,000 years. 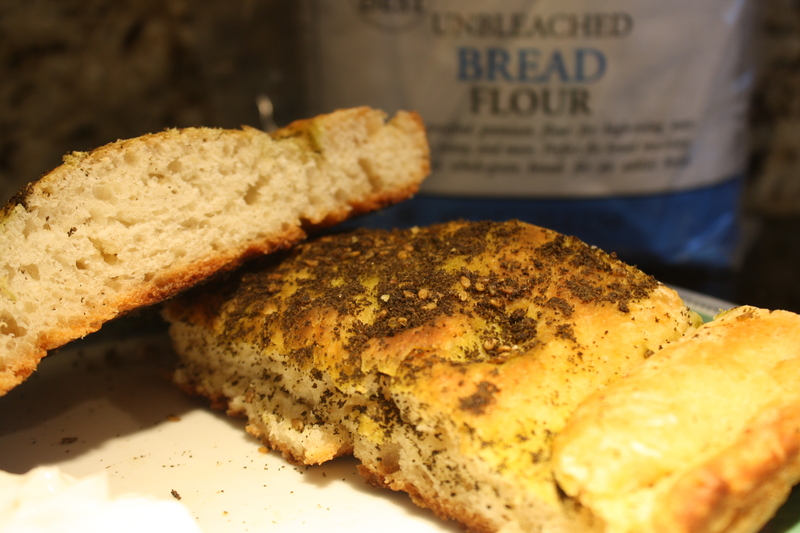 It has a high content of protein so it’s a great addition to vegetarian diets! As usual, I prepared a recipe from my #1 food magazine, Food & Wine (August 2009) and just added my personal touch. In a small saucepan, combine the quinoa with 2 cups of water and bring to a boil. Cover and cook over low heat until all the water has evaporated and the quinoa is tender, about 15 minutes. Uncover and fluff the quinoa, then transfer to a large bowl and let cool to room temperature. In a bowl, combine the oil and vinegar and season with salt and pepper. Add the peas to the quinoa with the pumpkin seeds, chives and dressing; stir. Season with salt and pepper and serve at room temperature or lightly chilled.